This spacious 1-bedroom apartment is available for rent in Lavapiés, Madrid. There is a lovely living room and kitchen with a sofa, armchairs, a television, and a dining table and chairs. The kitchen has an electric stove, a breakfast bar, and a microwave, while the bedroom has a double bed and a television. The bathroom has a toilet, sink, and shower. 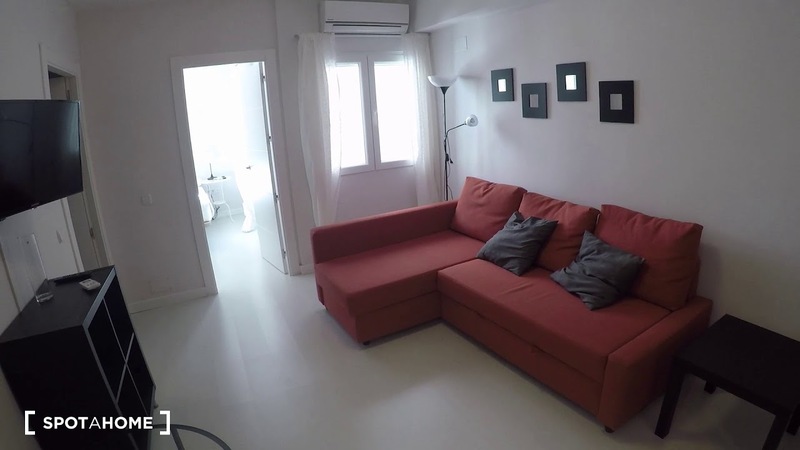 This apartment is in Lavapiés, where you'll find theatres and restaurants everywhere you look! There are also lots of gay-friendly clubs around, so if you're LGBT+ this is the perfect location for you! You'll be just a 10-minute walk from Puerta del Sol, one of Madrid's most famous areas. There you'll find shops, restaurants, and much more! The apartment has both AC and heating. You can watch television from the bed! The apartment is spacious and bright. There are lots of things to do nearby. A nearby bus stop serves route M1. Lavapies Metro station is a 4-minute walk away and serves line 3. Antón Martín Metro station is also a 4-minute walk away and serves line 1.